A press release dated October 14, 2004 states that the puzzle of magnetic stars has been solved by the prestigious Max Planck Society, full article reprinted below, but is this explanation proposing a solution or associating current theories that might fit observations? Examination of the press release immediately refers to special situations of how some white dwarfs and neutron stars are highly magnetic, but what is the process that separates the 2 classes of stellar objects from others. The theory proposes how a magnetic field is assimilated into a stellar object by the "fossil field hypothesis", and that gaseous nebula cloud holds remnant magnetic fields. According to their own words in the press release, "This demonstrated that two criteria would need to be fulfilled for the fossil theory to be viable." First we need to look at the special situations, in which the field of astrophysics seems to always have an answer for. How quick is a hypothesis submitted that explains only a facet of an observation while the supplement of related events that does not coincide with the new theory goes unexplained? In the case of the white dwarf, one must ask does a certain type of nebula contain higher particle concentrations related to the creation of an ambient magnetic field? For insight into nebulas lets examine mankind's definition proposed by the University of Arizona. Diffuse nebulae, sometimes inaccurately referred to as gaseous nebulae, are clouds of interstellar matter, namely thin but widespread agglomerations of gas and dust. If they are large and massive enough they are frequently places of star formation, thus generating big associations or clusters of stars. Some of the young stars are often very massive and so hot that their high energy radiation can excite the gas of the nebula (mostly hydrogene) to shine; such nebula is called emission nebula. If the stars are not hot enough, their light is reflected by the dust and can be seen as white or bluish reflection nebula. Note that many emission nebulae also have an additional reflection nebula component (as they usually also contain dust); a most impressive example for this is the Trifid Nebula M20. Diffuse emission nebulae are often called H II regions because they are mainly consisted of ionized hydrogene, H II - the roman number after the element symbol (here H) designating the ionization level: `I' would stand for neutral atoms, the `II' here means first ionization, i.e. the hydrogene atoms have lost their single electron, and for other elements higher numbers (ionization levels, or numbers of lost electrons) would be possible (e.g., He III, O III or Fe V). After some million years, the gas and dust of the nebula will have been used up for forming stars (and planets), or blown away by the stellar winds of the young hot stars. A newly born open star cluster will remain. From the physical viewpoint, the nebulae are an early stage of evolution of star clusters. Current theories state magnetic properties do not survive above the curie temperature, if so hydrogen plasma residing in present day nebula could not retain an organized magnetic field over time to be absorbed by new forming stellar objects as stated by the ‘fossil field’ hypothesis. The basis for the Max Planck Institute's theory is retention of a magnetic field while hydrogen is in a plasma state. It is here mankind's goes astray by stating ferromagnetic properties apply only to solids, but in the same breath use the same properties for preservation of a magnetic field over time. The reason why magnetic properties are lost above the curie temperature is due to molecular agitation a factor still present in plasma to a greater degree as by product of heat. Decay of a magnetic field alignment within a nebula as the temperature and time was never taken into consideration. For those who may consider a current or a charge maintaining an organized flow in a gas cloud, ponder this, what centralized force would control a closed loop circulation? Movement of electrons released by hydrogen ions could explain a source for a magnetic field emanating from a nebula, but observations of the gas clouds show little organized torroidal motion and convection about the conventional loop. A magnetic field is maintained in a stellar object by motion underneath the surface of the star, but mechanics of this process is only vaguely true with mankind's attempt to explain the creation of this field by presenting the dynamo theory. Does an ionized field of gas in an nebula exhibit organized magnetic fields, no, how can ions opposed to each other with like charges all trying to achieve equilibrium thru expansion into the void of space come together? Would a concentrated volume of hydrogen plasma come together and form a mass in the cold void of space or would the momentum of expansion due to pressure differentials overcome the weak gravitational force? Some stars of spectral type A (the `Ap stars') are observed to have a strong (300 to 30000 Gauss) static and large-scale magnetic field, of a chiefly dipolar shape. 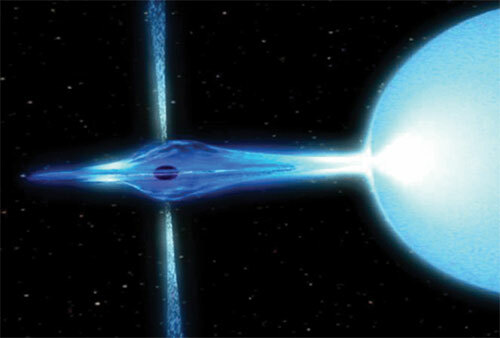 In one explanation this field is being continually regenerated by a dynamo process in the star's convective core. In another, the field is a remnant of the star's formation, a `fossil field'. These hypotheses have been competing since the discovery of magnetic stars half a century ago. The dynamo hypothesis has difficulty explaining the high strength of the fields observed. The main weakness of the fossil-field theory has been the lack of known field configurations which are stable enough to survive in a star for the whole of its lifetime. We demonstrate here the existence and formation of such stable magnetic fields, thus providing a solid basis for the fossil-field hypothesis. The results also apply to magnetic white dwarfs and a group of highly magnetized neutron stars known as magnetars. Can we apply the dynamo theory to compensate for any differentials in the ‘fossil field’ hypothesis when pertaining to white dwarfs? In a white dwarf, the upper portion of the solar mass sphere, vertical convection is limited due to gravitational compression thus constricting motion, which is a basis for the dynamo theory to work. Mankind assumes a white dwarf has no way to accumulate hydrogen mass to maintain a fusion process unless it is accreting (Accumulation of dust, gas or matter onto larger bodies such as stars, planets and moons) matter from a nearby star. One must consider why would vast quantities of mass would leave a stellar object due to gravity, would not the whole mass plunge as a unit since fringe gases susceptible to being stripped would not fuel a white dwarf? Lets examine a binary stellar companion scenario and the accretion of stellar mass from the minor partner. Current theories does not take into account the before and after mass to gravitational - distance ratio between the 2 stellar objects that were in orbital equilibrium before the collapse of the white dwarf. A distance that increases only by the reduction in the primary star radius vs. an exponential increase in gravitational force. The increase of radius of the minor binary stellar object and the shrinking to a white dwarf is small in comparison to the increase of concentrated gravitational force now present between the 2 objects. What should be considered is that any gravitational source capable of ripping away mass from the upper levels of a stellar object will in essence assimilate the entire minor binary stellar object, which would occur in all variations of this model. In this illustration from NASA, the binary companion to the white dwarf has stellar matter being ripped away by a gravitational stream binding the 2 objects. This scenario would only be possible if the minor object maintained its orbital distance by a repulsion force. Thus matter can be transferred as the orbit is maintained, but total assimilation by the increased gravitational focus at the closest point is prevented. This of course would be counter to Newton's Second Law of Motion. Also no explanation is given for the uniform expansion along the equator when the far side should be compressed due to the gravity of the white dwarf, but this is just an illustration. A Neutron Star with it's intensified gravitational field generated by compression of the stellar mass would capture the binary companion instead of slow accretion. Would not the system be subject to new force to mass ratios as the as the gravity would overwhelm established equilibrium based on distance that keep the stars in rotational balance? Is there another source responsible for the magnetic field like within a nebula? Theoretically mankind can not find vast amounts of matter in the universe to explain their gravitational observations, dark cosmic masses with high concentrations of iron, low reflectivity and little to no energy signatures would be below detection of our best instruments. This would provide a basis for these rogue fields. 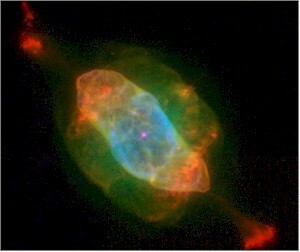 Although some consider the initial nebula a source for the magnetic fields of magnetic stars. So what factors should be considered? What binds the remnant magnetic field if hydrogen ions with the same charge are expanding from a high pressure area to one of low density the colder regions of the universe? Would not there be a magnetic repulsion force on the atomic level as ions resist consolidation due to a like positive charge overwhelming the weaker binding force of gravity? Could condensation gather a gaseous nebula cloud as low pressure voids spins ionized hydrogen atoms inward to the central pint or eye of low pressure as heat radiates out into the cold depths of space? Mankind must realize that a field does not just exist or preexist on a grand scale, but is created by movement of electron related charged particles released predominately by hydrogen atoms as they move about an object's core in an ionized state. A nebula (definition) is a cloud of gas where the expansion rate is contained initially by pressure wall created by a violent or rapid expansion of gas and over time by a collection of random collection of masses held about a common iron based gravitational center otherwise dissipation would occur. What is confusing to astronomers is the concept of a stellar nursery. Mankind is not privy to the whole sequence of events of stellar formation after the Big Bang. That some remnant gas clouds wharfing near cosmic objects are the by product of stellar formation and the gas was not captured by a cosmic mass that was initializing shortly after the big bang and its consolidation process is blown outward when the star lights due to gravitational compression. As objects coalesce out of the gas clouds shortly after a big bang do you expect that all nebula gas is utilized? No, that which is not captured dissipates out from the newly formed solar winds about and hovers about the dominating common gravitational center. Any magnetic field of ultra strength is one where particles of magnetism are flowing incoherent streams as opposed to a diffused bundle as diagrams from the Max Planck Institute below illustrate. One thing that mankind has learned about particle movement and its resultant wave format is any concentration of fields or particles are due to cooperation. With lasers the wave patterns of light particles are coherent as all reinforce each other. A mega magnetic field that develops in a neutron star or white dwarf is different as source of magnetic sub atomic particles that hover near the basic atomic structure of the core not only stack within the same exit and entry channels, but also becomes coherent with overall particle movement. Gravity inhibits particle movement at the core only as the movement of many streams come into unison is the force great enough to leave the comic object in a violent particle ejection thru a constricted polar channel. In the core many random sequences happen by chance when synchronization magnetic particles flow streams does not occur all magnetically related sub-atomic particles fall back into and around the core to organize again. Mega magnetic fields occur where core has sufficient iron to provide a base of magnetic particles to initiate flow, gravitational constriction of the core to provide rapid synchronization and bursts of particle streams, but allow for buildup providing amplification of the field. Nebula that are created by stellar objects are the result of their internal explosions of gases. The factors determining initial shape are dependent upon how stellar matter is released, bi polar, along the equator, intermittent bleeding in random areas or stable release points that slide between the pole and equator while rotation is involved. During the expansion phase gravitational forces from nearby cosmic objects and their solar wind are now the primary factors concerning shape. Dark matter, the atmosphere of outer space in this universe and density plane is a near vacuum compared to our blanket of air that surrounds our planet is compressed at the leading edge of a Big bang localized explosion. Being that, the dampening field, dark matter is uniform before initialization of a new galaxy or cluster The leading edge of the ionized gas takes the form of a bubble as seen in some of your photos in the universe. A nature formation created as gas presses outwards against a uniform dark matter field under compression in what is though as a total vacuum. As a nebula expands forces that determined its shape and formation are no longer present and some cases the external patterns of formation may not resemble the uniform interior structure as containment factors and gravitational sources change from the point of origin. How would a stellar object form? After a localized big bang, clumps of matter varying in size from massive rivaling small stars to molecules the precursor to interstellar dust would expand rapidly into what seems a total vacuum. Mankind does not realize that there are other particles in space that determine expansion of matter. Ask yourself what force is necessary to reverse the expansion of ionized gases expanding out of a big bang? Mankind has never witness the birth of a star yet some have witnessed stellar death, a super nova. If one was to experiment with a vacuum could a coulomb charge attraction similar to what is present in today's assumed stellar nurseries, gravity or just condensation due to lost of heat overcome this force of separation of particles to form a new cosmic mass? Does not decompression rip almost all objects from within a plane with air pressure differentials that are just 30 thousand feet above the surface of the Earth? Would not a catastrophic leak in the space station rip apart its interior? So how do you think a star would form in the vacuum of space by accretion or condensation of a gaseous cloud? What force would gather ionized hydrogen atoms? Certainly not your weak force of gravity or even charged particles as most hydrogen atoms stripped of an electron would take on repulsive like charges. So what is the process of stellar formation after a localized Big Bang occurs in a sector of the universe? The idea of the "Big Crunch" in that it is correct that there is a compression phase after a "Big Bang", but these sequence of events are on a local level with gravity orchestrating actions via centralized galactic black hole, which gathers all available matter within range of initial existing galaxy. The processes that occur in the capture and expulsion of matter within a Black Holes is covered in more detail in this paper. Once the localize Big Bang occurs the expanding blast wave produces a secondary effect. What is seen as the surface of the expansion bubble is now being dampened by the build up dark matter and galactic repulsion particles at the expansion edges. This action sets up an opposite and equal reaction as the subsequent waves, echo compression waves are reflected back towards the original point of the Black Hole expansion. Thus initiating random condensation points within the sphere of expansion. Light elements the first to expand outward are forced back permeating the slower moving fluid heavy mass propelled by the blast initiated from the compressed remnants captured of galactic mass by the dominant black hole into the low density environment of the universe. Light elemental gases of super ionized gas would then inflate pockets inside heavy matter thus stretching and thinning the containment perimeter of heavy matter. Examining a microcosm of these events, globules of heavy matter laced with a lattice of honeycomb hydrogen ions or other light elements once cemented together then collapse due to cooling or compression as pressurized containers of light matter transfers most of their heat content to the surrounding matter. With a higher surface to mass ratio dissipation its latent heat content disperses quickly into the depths of space and cools, in essence the heavy matter becomes a heat sink. Do you not see this same process occur during volcanic explosions as trace rocks left of the event are frozen in the form of pumice. A collapse or compression of the pliable matter occurs due to overall thermal reductions of the mass surrounding the light elements, thus shrinking the containment perimeter. The heat and gaseous expulsions pressurizes the immediate area surrounding the mass once heat is absorbed pressures fall in the spaces between clusters of masses. This creates a temporary low pressure zone near the surface of the mass, resulting in the capture of more minor globules of matter being sucked in to fill the void with gravity assisting capture at extreme close proximity of the dominant mass or temporary gravitational center. As assimilation progresses into the greater mass, reduction of the temperature of the surface perimeter of the primary mass is further reduced, thus a chain reaction starts. A cycle of a primary shrinking mass, which creates a pressure void in near spatial bubble edge zone ( the temporary spherical shell of lower pressure that forms around the surface of a mass due to void left by compression, which shrinks in volume quickly as the heat content dissipates into space while pressures of the ambient dark matter field pushes back for containment) , the cascading affect is attraction of smaller masses, with the resultant growth of the primary and the cycle repeats . As random mass are captured along the surface momentum of the object assimilated on the surface provide a torque, which is accelerated by condensation increasing the relative spin of the newly formed cosmic object, thus reinforced as parts of the mass are attracted to nearby objects and then overshoot adding momentum to the spin of the object. Once thermal emission no longer supports compression of the primary mass and gravity gathers and holds the containment of most matter from dissipating into the near vacuum of space. The object essentially gathers all mass within the area until surface pressure differential and gravity can no longer attract mass away from the nearest cosmic object. and the cutoff of cooling light elements. the matter would cool as heat and energy dissipates into space pressure voids attracts mass until sufficient matter is gather to invoke gravitational attraction of lighter elements. The key to the fusion process is the compression of the honeycomb heavy matter is their hydrogen surrounding this impregnated matter to provide sufficient pressure, second once compressed are there enough pockets of fusion initiating a reaction to cause a net positive gain of heat and light. Third is the heat and light produced overwhelm the total mass so that it radiates. But this process occurs in steps. Once a stellar object gathers enough mass to initiate the fusion process in the core it heats up the core expands and compression is no longer there to maintain a fusion process so it sputters and shuts down until heat is transferred away, thus radiating into space. The surfaces cools again creating another pressure void near the surface thus attracting more mass. Compression starts again as further condensation of the core allows hydrogen to be stirred and random points of hydrogen nuclei fuse within the core. The stellar mass sputters through many cycles until the mean compression pressure in the core is not displaced by the expansion force created by the fusion process. The star's intensity is determined by the fusion output in relation to the heat and light carrying capacity of uniform unit of mass of the stellar object. How can we gain insight into stellar formation from the present theory of collapsing gaseous nebula clouds. Current theories of star formation fall short in the fact that many rare stellar deaths, super novas have been recorded by mankind, although no concrete evidence of a star birth. Present gas nebula clouds are suppose to be collapsed by gravity, but how is this so? A nebula cloud exists in the fact that binding force of gravity counters the movement of hydrogen to a low density environment of space. pressures slightly vary as currents are formed trying to achieve equalization thus overshoots are observed as columns and cloud like puff pockets. If you observe Jupiter with its mass, can it gather the asteroid belt with its powerful gravitational pull? The slow orbital momentum of its moons is enough to avoid capture. so how can a cloud of gas with a pressure concentration slightly above the near vacuum of space with its mass spread across many cubic light years and no centralization initialize concentration or compression. The key is to consider the amount mass vs. volume. It is here where theories fall with no point of gravitational concentration as the hydrogen cloud is generally equalized in pressure. If gravity is a wave how do you explain the cancellation of waves emanating from many sources within the cloud? If gravitational compression was due from a single source, why the distorted shapes as opposed to a bubble? Here we examine a Numerical Simulation of a nebula cloud with a mass 50 Suns and a diameter of 1 light year to see if the hydrostatic equilibrium holds as its radius is collapsed in a series of factor 10 steps. The life cycle of a star does not necessarily follow a sequence, but the star does evolves based on many factors: Mass, Availability of Fusion matter, thermal core mixing, The light to heavy elemental core ratio, thermal conductivity of the stellar mass due to elemental composition, total spherical area for heat transfer. Yes it is true that stellar objects do evolve, but the initiation of a stellar can form along most classifications of mankind's 0sequence of stars. Current theories cannot explain the recent increase of thermal and light output from the Sun though some will say the Sun has not increased in brightness over the last 2 years. Did gravity increase on the Sun without additional mass? What is responsible for the increased rate of fusion without additional compression? How is containment possible with the recent expansion of the sphere? What about the high activity of solar flares and sun spots when we are now at our solar minimum? None these questions can be answered under current theories. white dwarf heat dissipation is more concentrated as overall surface area for spatial thermal transfer is greatly reduced, so a reduced fusion process in large mass could appear as highly elevated in a smaller spatial spherical surface area. compression leads to movement and if the stellar mass does not light a balance between the slow movement of the core and generation of heat vs. gravitational pressure holding the mass vs. available hydrogen and other light element plasma ions the area. Quoting from Max Planck from under their diagram they have run numerous simulations to explain a tennis ball seam to describe a magnetic field of a white dwarf all but ignoring basic theories in particle movement. Fig. : Shape of the magnetic field lines in a magnetic star, computed by numerical simulations (stereo images upper left). They form a ring of field lines twisted around each other (blue). Field lines protruding through the surface of the star (red) are held together and stabilized by the twisted ring inside the star. This is illustrated by the schematic sketch (the lower right) and the cut through the star (upper right). This magnetic field configuration drifts slowly outward (over a period of hundreds of millions of years) under the influence of the finite electrical resistivity of the star, then distorts into the shape of the seam on a tennis ball (lower left Fig. A), after which it disappears from the star. A serpentine distribution of magnetic anomalies distributed along the surface of a white dwarf has in theory has taken the shape of the seams of a tennis ball. Although a relatively new observation in astrophysics, the surface format on stellar masses can be explained. due to its dense compressed structure, and basic particle movement to achieve a magnetic subatomic particle flow equilibrium. Magnetic anomalies and how the mechanics of field's creation within a stellar object are still a mystery to current science, yes science can predict effects and analyze fields, but do they understand the secrets of how the relationship of the atom and the sub atomic particles linked to field flow and interact? First to gasp an understanding we must introduce new basics, the fusion process to the scientific community, which examines the relationship between the light elements and heavy metals primarily iron within the core. Random magnetic anomalies near or on the surface of a white dwarf or stellar object are not by chance, but part of an organized process creating what seems to be chaotic surface events. As small pockets of iron plasma floating about the surface of a dense hydrogen-helium white dwarf and each cluster responds with an individual magnetic field to each other while aligned to the stellar poles. If one was to at the start of the process most anomalies would gather along the magnetic equator the neutral point between the magnetic poles. As crowding starts to occur along the magnetic equator, groups line up side by side in a ring tend to have sections slide north and south of the neutral zone to escape the magnetic repulsion of the tightly clustered anomalies and two factors of its placement on the surface come to light. The relationship to other magnetic anomalies on and near the surface of the stellar object and the overall equilibrium to the stellar poles. Magnetic anomalies when crowded about the surface in a line begin forming the shape of a wave with the wave's amplitude dependant upon the crowding in the now deformed ring as the force to slide north or south and away from each other and the strength of the magnetic pole of the ambient object and position of the original starting anomaly latitude. The result is a serpentine arrangement, sine wave, which reverses near the pole as the stellar poles tend to impede encroachment thus reversal of the magnetic anomalies back towards the equator occurs. Thus, oscillation about the equator is like the seam on a tennis ball. After gravitational induced consolidation of the newly formed white dwarf is completed in most cases the nuclear fusion process is stepped due to core stirring, thus making isolated pockets of light element fuel available under the exponentially increased compression due to the concentrated flow of gravity particles. Convection forces breakaway temporary ellipsoid bubbles containing a mixture of light and heavy elements primarily iron plasma on the edge of the stellar core to rise to the surface. This is no different than heavy particles of soot being caught in a draft of fast rising hot air. Once on the surface of a dense white dwarf the magnetic properties of the anomaly immediately align with the poles where interference from other anomalies floating about the surface are distant. Free to move the anomalies now aligned seek a place way the magnetic repulsive force affecting the polar coordinates of the anomaly are minimal, a location that only exists along the magnetic-rotational equator. For askew magnetic-rotational axis see Phase 3 for exceptions. In the second phase as more anomalies are suspended about the surface of the white dwarf compression along the magnetic equator occurs as each anomaly's magnetic field starts to crowd each other jeopardizing the stable side by side alignment. Rippling occurs among the anomalies as they pop away from the magnetic equator into magnetic polar repulsive weak points, which limits the oscillation in the Y direction in proportion to the factors of stellar gravity (surface viscosity and tension on the white dwarf are sub components controlled by gravity in the hydrogen-helium medium), rotational torque applied to the surface anomalies, compression of adjacent surface magnetic fields due to the volume of anomalies floating about the surface, the strength of the stellar magnetic field and the average mass & magnetic strength of the anomalies. The trans formation into a small wave pattern occurs by a random chance. As the volume of surface anomalies increase, some anomalies spend more time away from the equatorial neutral point as the equilibrium point moves further away from the x axis. There comes a point when several adjacent anomalies are pushed away on the same side of the equator, thus reinforcement occurs a the first minor wave is achieved as anomalies pop out of the magnetic equatorial plane finding equilibrium when others support its position from below near to the crowded plane. Complete wave formation happens as a crowded surface line forces more and more anomalies towards the poles until the number of anomalies rising to the surface of the white dwarf is offset by the number falling thus maximizing the amplitude of the sine wave formation. Thus the magnetic repulsive force from the polar regions establish an equilibrium with the halt in the Y direction of the wave form of anomalies pushing up from the magnetic equator. In figure 3 we can se how the interrelationships of adjacent magnetic fields are affected in the local area while still being govern in the wide area by the stellar magnetic field. In the case that rotational axis and magnetic axis is askew, upon an increase in anomalies compression would occur and a wave format would already be initiated due to magnetic rippling as the particles y coordinates oscillate in relationship the rotational and magnetic axis differential. The texture of this nebula is still unknown in main stream astrophysics, but there are clues here if you look with a fresh eye. This Hubble image of IC 418 is a false-color representation, based on Wide Field Planetary Camera 2 exposures taken in February and September, 1999 through filters that isolate light from various chemical elements. Red shows emission from ionized nitrogen (the coolest gas in the nebula, located furthest from the hot nucleus), green shows emission from hydrogen, and blue traces the emission from ionized oxygen (the hottest gas, closest to the central star). The remarkable textures seen in the nebula are newly revealed by the Hubble telescope, and their origin is still uncertain. 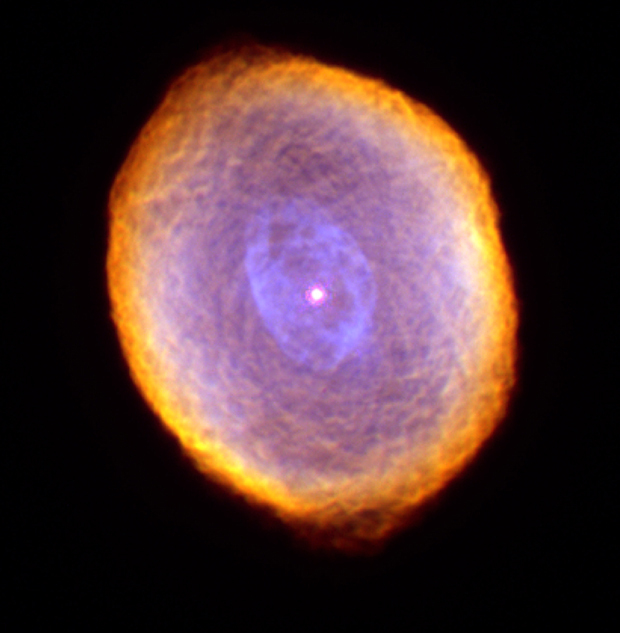 The Spirograph Nebula is unique in that several factors have to be in place to create this pattern. First a primary heavy gravitational stellar object and a binary low mass stellar group that orbits the primary, a triple star system. As one of the low stellar masses ejects streams of hydrogen jets from its polar regions a spirogragh pattern emerges as the binary stars rotate many times about each other to the one orbit of the primary stars. The primary Stars solar wind is responsible for the expansion with breaks in the expulsion responsible for inner bubble. The total oval shape takes form after a long period expansion due the wobble in the triple star system. 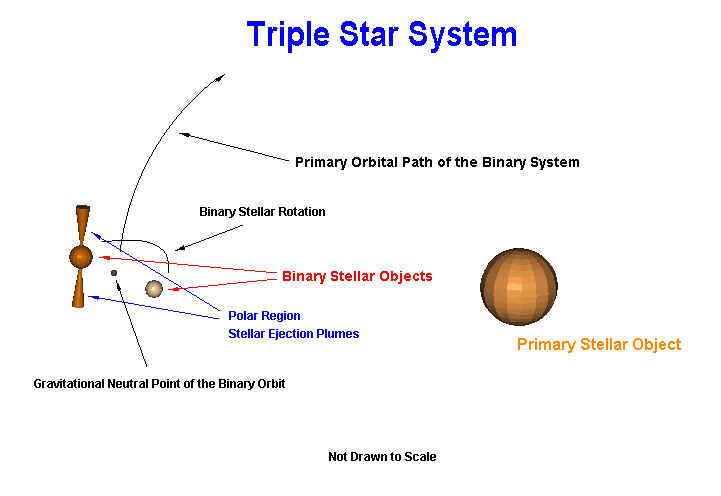 This wobble (see figure 4) is tow tier primarily between the binary system and primary stellar object and the minor effect is between the binary stars and their gravitation neutral point. Tight patterns seen on the outer edges of the nebula are replaced with a wider mess in the interior as the mass of the of one of the binary stellar objects is reduced thus expanding the orbital distance between the two objects about the point of mutual rotation. For asking about the repulsion factor, it decreases at a faster rate than gravity as the orbit expands. and rotation has most components of the upper layers of the star rotating in unison. 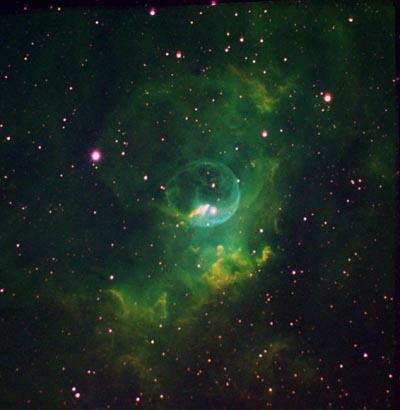 In this nebula a uniform stellar explosion initiated the primary green bubble, secondary bipolar explosions deformed the bubble into an oval and its orange gas, third an uniform explosion creates the inner blue cloud and finally a concentrated high energy bi-polar explosion rips thru the cloud with gaseous particle concentrations noted in red expanding quickly once outside of the main nebula containment bubble. Galactic Repulsion Particles: Theses particles are unique in the fact that it affect primarily stellar masses lit and unlit, but follow the same principles of the common repulsion particles affecting all cosmic objects in a solar system. The difference is in how they are created and common point of origin. A galactic repulsion particle is unique on how it affects mass, created in the core of Black Holes this particle rips thru light masses such as planets, moons and other small cosmic objects. the force is applied only the heavy mass cosmic object as it slows penetrating the likes of stellar cores and applying force in the same direction of motion. How quick is a hypothesis submitted that explains only a facet of an observation while the supplement of related events that does not coincide with the new theory goes unexplained? How does one explain the enormous magnetic field strengths of the so-called `magnetic stars'? This question concerning magnetic fields in the cosmos, first posed half a century ago, has now been answered by scientists of the Max Planck Institute for Astrophysics in Garching. With 3-dimensional numerical simulations they have found the magnetic field configurations that underly the strong magnetic fields observed on the surface of the so-called magnetic A-stars and magnetic White Dwarfs, and how these fields can survive for the life time of these stars (Nature, 14 October 2004). The results confirm the ‘fossil field’ hypothesis, which proposes that these magnetic fields are remnants of the magnetic field in the gas clouds from which stars are born. Fig.A: Shape of the magnetic field lines in a magnetic star, computed by numerical simulations (stereo images upper left).They form a ring of field lines twisted around each other (blue). Field lines protruding through the surface of the star (red) are held together and stabilized by the twisted ring inside the star. This is illustrated by the schematic sketch (the lower right) and the cut through the star (upper right). This magnetic field configuration drifts slowly outward (over a period of hundreds of millions of years) under the influence of the finite electrical resistivity of the star, then distorts into the shape of the seam on a tennis ball (lower left), after which it disappears from the star. This discovery is important for three classes of stars in which strong magnetic fields are observed. The most well-known are the so-called `magnetic A-stars', otherwise known as normal stars (about 2 to 10 times heavier than the Sun) which have a magnetic field like a bar magnet. An example is Alioth (Epsilon Ursae Majoris, the fifth star in the Big Dipper). Among the White Dwarf stars there are stars with magnetic fields 100,000 stronger than this, and finally there are `magnetars': neutron stars with fields 100 billion times stronger than that of a commercial bar magnet. The magnetic field of all these stars is smooth and static, in contrast with the field of the Sun and similar stars, which is weaker, consists of small patches, and changes continually. Since the discovery of magnetic stars over 50 years ago, there have been two competing hypotheses for these magnetic fields. In one theory, the field is assumed to be generated by convective motions in the core of the star, in same way as the Earth's magnetic field. The other is the `fossil field hypothesis': the idea that it is just a remnant of the magnetic fields trapped in the gas clouds from which stars are born. Some evidence points to this possibility, for example the fact that the observed fields do not change over time. The main problem with the latter theory has been that no magnetic field configuration was known that can survive for the life of a star. All configurations studied so far turned out to be unstable, and would decay within a few years. This demonstrated that two criteria would need to be fulfilled for the fossil theory to be viable. First, stable field configurations have to exist in stars, not self-evident in view of the slippery, fluid nature of the stellar material. Secondly, there has to be a path towards such a field configuration from the magnetic field with which the star is born. This configuration has now been found by the Max Planck researchers with numerical simulations in which the evolution of an arbitrary unstable initial field configuration was followed to a stable final state. The stable state always turned out to have the same shape - a ring (torus) of twisted field lines, similar to the configurations used in modern controlled fusion experiments. It looks a bit like a car tire in which broken steel wires of the wire mesh stick out through the surface. At the surface of the star, these field lines make up an approximate dipole field, as seen in the observations. With these results the Max Planck researchers have provided a solid basis for the theory of magnetic stars: as remnants of the magnetic fields threading the gas clouds from which stars are formed, and it explains why the fields can survive for hundreds of millions of years. At the same time, the results make it likely that the magnetic fields in White Dwarfs and neutron stars have the same structure and stability.